A few weeks ago I was asked by DJ John Crowston to review his popular Soul & Motown Disco Night at Redbourn Club. Nigel Milner is back at Ashby Mill Road club before the New Year with the ever popular Northern Soul & Motown night. Get down to The Baths Hall’s auditorium for the best of Northern Soul and Motown classics. Plus, in the downstairs lounge area, dancing to the 70s and 80s soul hits from Luther Vandross, Sister Sledge, Dina Carroll and more. We have many different scenes in Scunthorpe you just have to know where to find them, if you like and support the Soul scene, go show your support. There are various different soul nights one we often see pop up is The Ashby Mill Road Club. 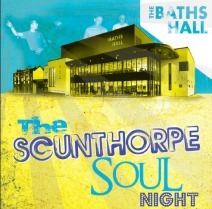 Join us in The Baths Hall’s auditorium for the best of Northern Soul and Motown classics. Plus, in the downstairs lounge area. Tickets are priced £7 (advance) or £9 (on the door). Booking fee may apply. DescriptionNorthern Lincolnshire Soul Club proudly presents here at Ashby Mill Road Club – the Hub of Northern Soul in North Lincolnshire – another Northern Soul and Motown night, again the last Saturday of the month 7:30pm till 1am as it will be throughout most of 2014 and beyond. With Soul-City DJ’s Denis B (Cleethorpes) and Stan the Man (Blackburn) & DJ Milly (Scunthorpe) plus guest DJ TBD playing the best in Classic Northern, Modern and Motown Soul OVO non stop, record requests always welcomed. We have a good sized dance floor, plenty of seats, club drink prices and off road parking. Food and coffee now available as well as nearby as are ATM’s All this for £3 on the door.